But love forever belongs to your first-love. He’ll everlastingly yearn for his first. They belong to Syrian-born poet Abu Tammam who spent his youth in Homs, of all places. All this is to recount my first love at first sight – not of a woman but of a supercar. Of all the Volkswagen Beetles, Chevrolet Camaros, Nissan Patrols, Mercedes and BMW 4x4s I owned and drove over the years, my heart belongs to that supercar. It was a hot summer night in 1973 and I was walking towards the Palm Beach hotel on Beirut’s seafront when I passed by the Ain el-Mreisseh showroom of “Bassoul-Hneine” car dealership. “Bassoul-Hneine” were and still are the agents for several car makes, chiefly Renault and Alfa Romeo. The showroom was well lit. The sight of a supercar in metallic gold, sitting majestically at one end of the showroom, hit me like lightening. It was indeed love at first sight. After spending some 10 minutes admiring it from the front and the driver’s side only, because of the way it was parked, I spent a good part of my shuteye time wondering about its interior, its specifications, and above all its price. Bassoul-Hneine were regular advertisers in my weekly magazine. So first thing in the morning I called in my advertising manager Adel Merhi and described what I saw. On starting the engine, I was thrilled to hear a vigorous V-8 roar. And the five-minute drive home felt like sitting in a fighter jet ready to launch. On arriving home to take my three excited little boys’ for a spin, I could see their popcorn leaping out of its box. The Alfa Montreal was a technological flagship. It was innovative, impressive and expensive. It was more expensive to buy than the E-type Jaguar or the Porsche 911. 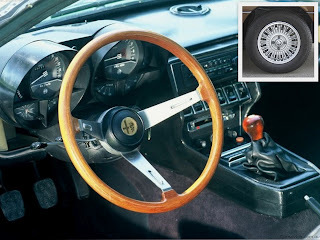 The Montreal's design by Giuseppe Bertone was anything but conservative. Among its innovative features were headlight eyebrows that pivoted down only when needed to give the car a clean, menacing look with its headlights off. One of its key features was an easy-revving, small displacement gem of a V8. 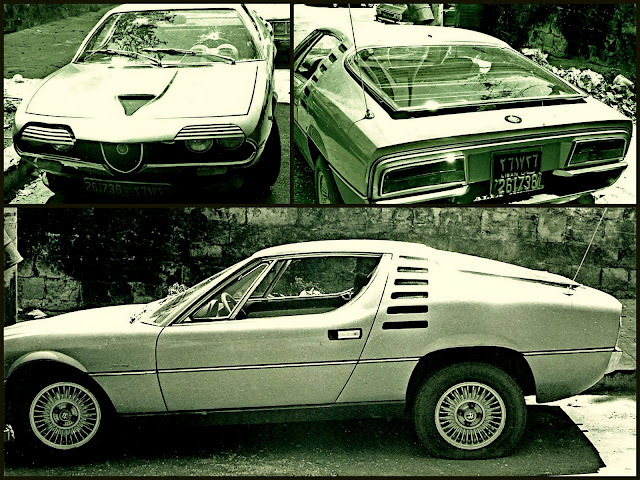 A detuned version of the 33/2's brilliant engine was dropped into the front of Alfa's Montreal. This motor, with its tidy alloy construction and SPICA mechanical fuel injection, was far ahead of its time. It made 200hp out of just 2.6 liters, a very respectable specific output for a naturally aspirated car. A five-speed manual gearbox and ventilated disc brakes were also used. In short, it was one of the liveliest powerhouses of its day. There were 3,917 Montreal's produced between 1971 and 1975 and they were never exported to the United States. Enjoyment of my Montreal lasted just over a year. By late 1974, the steady rumble of an approaching civil war had me send the family to England. By early 1975, the internecine strife in the country saw me hide my “first love at first sight” in the basement garage of the Sabbagh Center on Hamra Street, where I had a PR boutique. A stray shell hit the office within months, but the Montreal remained safely “mothballed” in the third level basement for a year-and-a-half. A lull in the civil war in 1977 encouraged me to get the car out with the help of car electricians and tyre mechanics. But most if not all highways and inner city roads were inaccessible, roadblocks were everywhere, the gas pumps were invariably dry and carjackers were a good many. Within weeks of its recovery from “internment” in the Sabbagh Center, the Montreal was riddled with bullets while parked in front of my building during a firefight involving al-Mourabitoun and a rival militia. It was time I thought to part ways. I agreed to sell the Alfa superstar to a dear friend who wanted it for his younger brother. The brother escaped unhurt when he crashed it beyond repair within months. That first love at first sight was also my last.